Portable Solar Power for Off-Roaders, Serious Campers, etc. I’ve spent some time in the woods in my life. A couple of hunting seasons in my formative years involved days and days of cold, wet, and generally miserable camping. Nights were spent in a crowded cabin that I shared with my cousins, uncle, and grandfather, none of whom had much tolerance for my whining and complaining (I admit it, I was a terrible hunting companion as a child). While my discomfort was largely the result of a bad attitude, my hunting camp experiences taught me that you can’t put a value on the comforts of home. Cold beer, hot coffee, and plentiful lighting are nothing to sniff at, nor is the option to watch a movie when it gets dark outside, or bust out a laptop and do a little work after the kids fall asleep. Here’s my attempt to build an indefinite solar power system for camping, overlanding, etc. using a Renogy 100W panel and the ArkPak. The trouble is, it’s hard to have these things on an extended camping trip (or overlanding trip or whatever)…unless you’ve got a portable source of power. That’s what I’m going to talk about today. Generators require fuel, and you can only bring so much fuel with you wherever you’re going, not to mention that a “cheap” generator costs $1,000, or that many campgrounds have strict policies about operating generators after dark. Portable power packs (like the ArkPak Tim reviewed on TundraHeadquarters) eventually run out of juice. Power gimmicks, like pots and pans that convert energy from a fire into electricity, or small solar cell arrays that generate 5-10W of power, aren’t sufficient to do much beyond charging a cell phone. Alkaline battery-power is fine for limited use, but gets awfully expensive over time…and they don’t really make battery-powered refrigerators or coffee pots for camping, which are two things I really like. 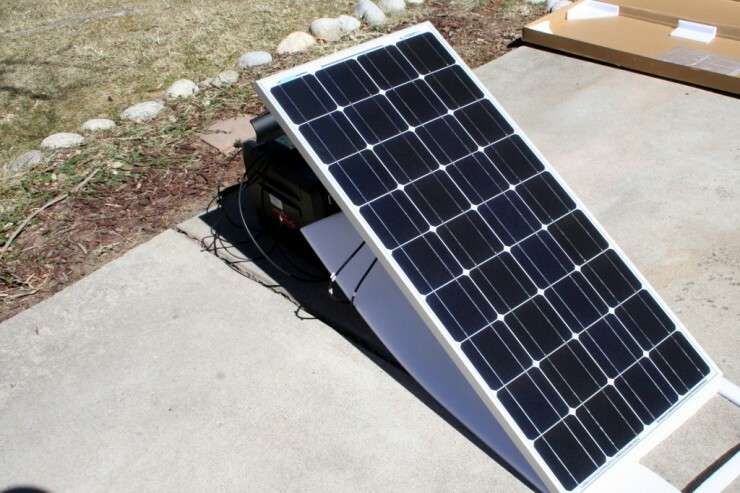 Yet if you combine a 100W solar panel, solar charge controller, and the aforementioned ArkPak, you’ll have an inexhaustible source of power that’s capable of doing everything from making coffee to running a 40″ TV. 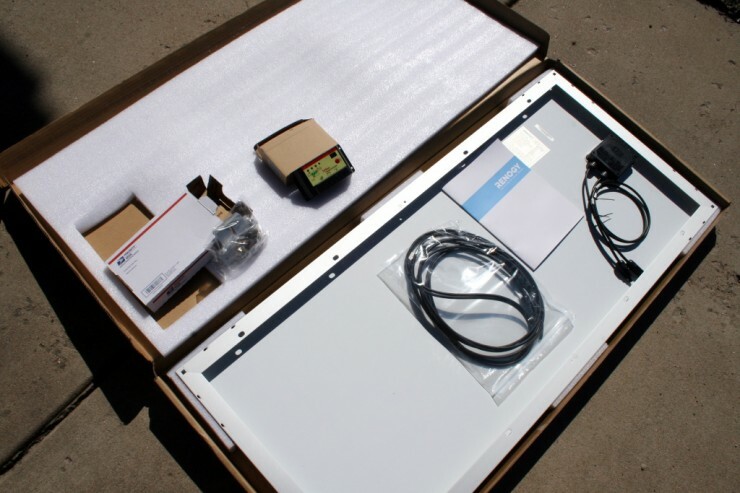 Here’s what Renogy sent me – a 100W panel (upside down in this photo, it’s on the right under the wiring and manual) a solar battery charge controller, mounting kit, and wiring. Total cost for this setup? About $700. I paid $170 for the Renogy panel and charge controller, $399 for the ArkPak, $110 for the 93ah battery, and $10 for some wire and connectors. 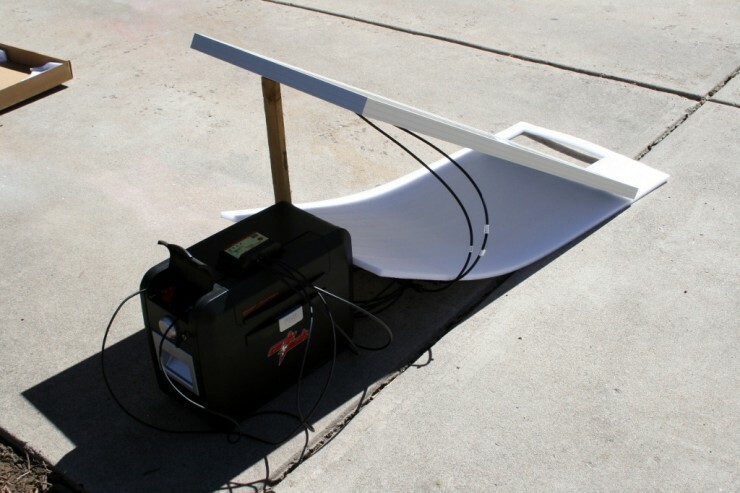 I started out by testing everything: I attached the panel to the charger, and then the charger to the ArkPak. I used my trusty RadioShack multimeter (ghetto, I know) to measure voltage at every connection, then I set to work on a quick test. Here’s the setup I was using – I was basically leaning the panel up against the ArkPak, and putting the wiring and charge controller in the shadow under the panel so they didn’t get too hot. This photo was taken in my driveway – I ran the actual test in the yard. First, I ran down the ArkPak to 45% capacity. I accomplished this by watching some TV (the ArkPak can power my 37″ TV no problem) and charging/powering my laptop. Second, at about 8am, I hooked up the ArkPak to the solar charger and set the panel out in my backyard. I set a timer to go off every hour, reminding me to move/readjust the angle of the panel to track the sun. In fairness, I skipped a couple of moves. The green indicator on the charge controller lit at about 3pm, indicating the battery was charged. I left the panel hooked up a few minutes longer, then disconnected things and allowed the ArkPak to assess the battery’s charge level. After a couple of minutes, the ArkPak indicated 100% charge. Summing up, I was able to recharge 55% of the battery capacity in the ArkPak using the solar panel for approximately 7 hours. I suspect the process might have been faster, because a) the green indicator may have lit right after 2pm (when I checked the status and moved the panel) and b) I skipped moving the panel at 9am and again at noon. Step 1) Open up the Renogy box. You’ll need to find some wire to connect between the charge controller and the ArkPak, and then hook the panels to the charge controller. I used 10 gauge wire to connect the charge controller to the ArkPak, mostly because I didn’t want any resistance in the wire to limit charging. When I first set things up, I used a multi-tester to measure the voltage output from the panel. The highest reading I recorded was 22.1V DC, which corresponds to about 98% of the maximum output. This translates to about 7.5amps of current going into the battery. While the highest voltage i recorded was 22.1VDC, this was the voltage I observed when the panel was angled (sort of haphazardly) in my driveway. That voltage indicates the panel is likely producing 90-95W. 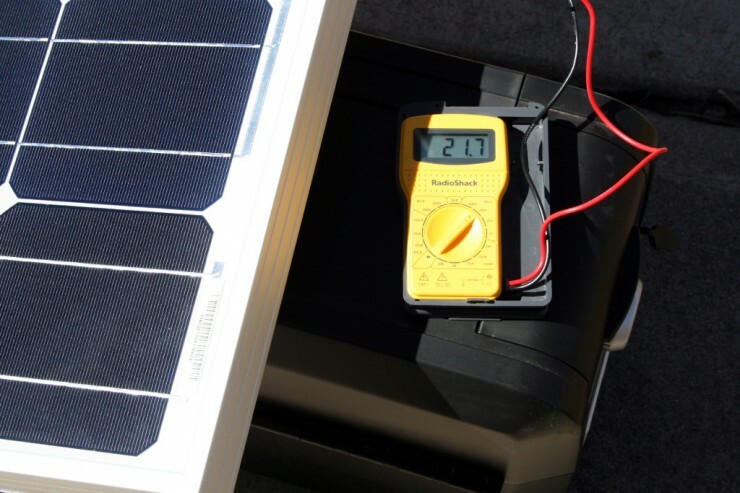 If we assume we’ll get this high level of current output continuously (we won’t, as the orientation between the sun and the panel has to be perfect), it will take a little more than 6 hours to put 50ah of energy “back” into the battery in the ArkPak. Step 2) Point the panel at the sun. I took a very lazy approach to this task. In the morning, I hooked the charge controller to the battery, leaned the panel against the ArkPak, and then set an alarm to go off hourly. When the alarmed beeped, I’d go outside, move the panel a little bit, and then forget about it for another hour. However, I skipped a couple of moves during my test, and it doesn’t seem to have effected the result much. Theoretically, the panel should have recharged the ArkPak in about 6 hours. I observed 7. Renogy claims that their solar panels provide excellent performance in low light conditions, which may explain why my somewhat lazy approach to panel placement generated good results. 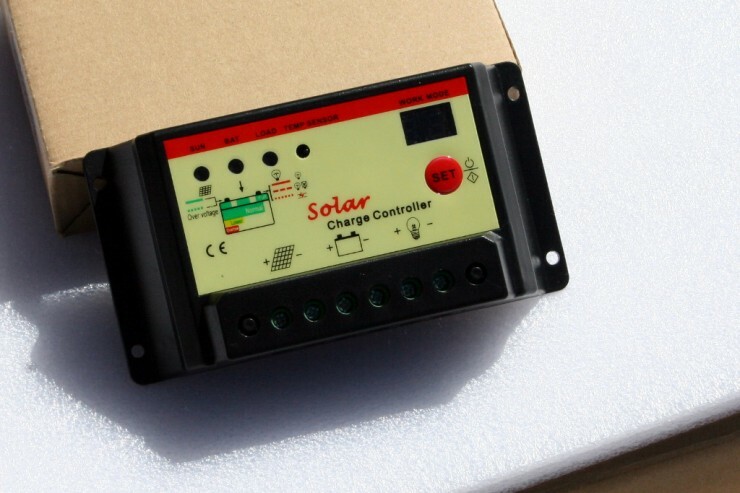 The included solar charge controller is sort of cheap looking (and feeling). It’s a minor complaint, but the screw terminals and cheesy graphics definitely have a low budget feel. Still, it had a 12VDC output (rated at 1amp or less) that can be used to power lighting, and a programmable feature that would automatically turn that output on when the sun went down. Step 3) Keep an eye on the battery status on the solar charge controller. When the indicator turns green, you can disconnect the solar charge controller, disengage the battery disconnect on the ArkPak, wait a minute or so, and check the capacity rating. I did this because I wanted to be sure it was at 100% before I officially disconnected everything. When the panel wasn’t in use, I flipped it over. That way, I didn’t have to worry about shorting something out just in case my power output wires touched. The ArkPak will beep at you if the battery disconnect isn’t engaged, or if it isn’t fully engaged. Be sure to turn the handle as far as it will go too. 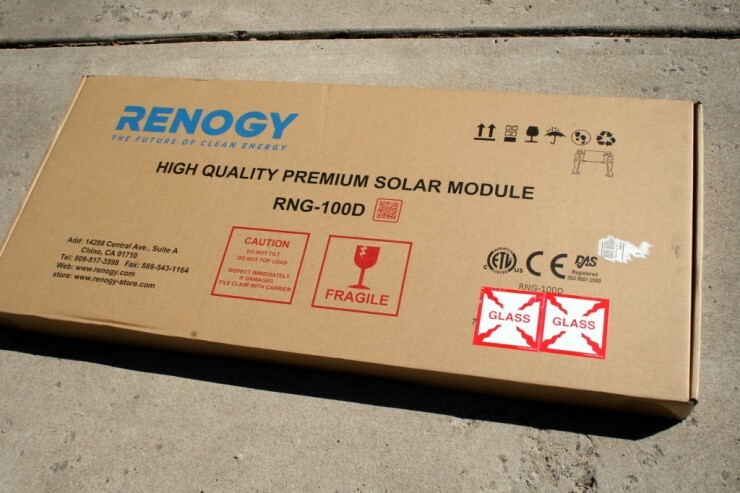 The Renogy panel is supposed to be very durable, but it struck me as sort of fragile. I’d be careful transporting it…I’d suggest you keep it in the box it comes in whenever you’re moving it. The Renogy panel comes with mounting plates, and it wouldn’t take much to make these “quick mounts” by just using wing nuts instead of regular nuts and bolts. The panel itself is very lightweight, so moving it on and off the roof of your vehicle (or the roof of your cabin) is no big deal. Since the panel isn’t waterproofed (Renogy says you should only use it in dry weather), quick mount and dismount is important. The panel is sort of fragile, so I’d recommend keeping the box the panel comes in for storage and transport. That will prevent breakage, scratches, etc., as the box and packing materials are pretty durable. I’m not much of a serious camper (I spend 1-2 nights in the woods, maximum), so I don’t know that I’d bother to haul the solar panel with me on a camping trip. The ArkPak has plenty of capacity for 1-2 nights in the woods, so recharging it isn’t a concern. If I was camping for longer than a night or two – or if I was going to run a refrigerator all day while camping – the panel would be a must-have, as I would’t want to use my vehicle to recharge the ArkPak (why waste gas or risk a dead battery?). Another view of the setup I used mock-ed up in my driveway. It’s sort of hard to see it, but that black box is the ArkPak Tim used for his review on TundraHeadquarters.com. However, what’s really exciting (to me) is that I now have a solar power source in case of a home emergency. While this power source isn’t going to run the whole house, it could very easily keep the family’s cell phones, tablets, and computers charged, as well as power the TV so we could watch emergency broadcasts. I could even put some food in my refrigerated cooler and keep it from spoiling if push came to shove. Is this use case likely? Probably not. But it’s comforting to know I’ve got options if the power goes out for days. 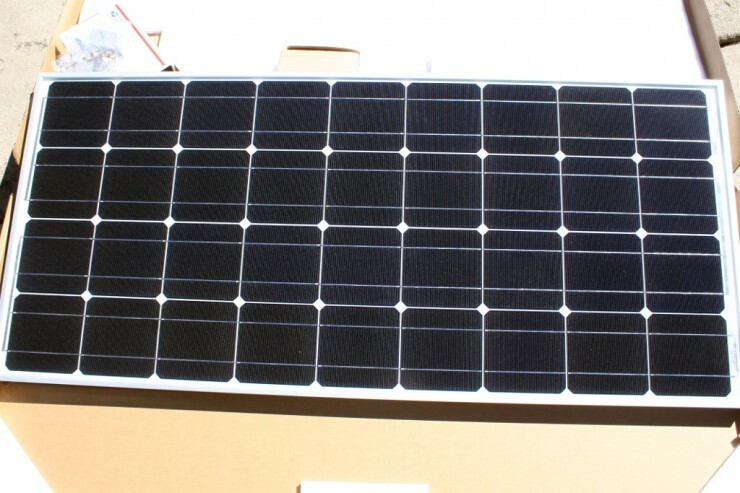 All in all, I’d say that anyone with an ArkPak would be wise to consider buying a Renogy panel (be sure to buy the one with the charge controller, as the ArkPak doesn’t include one). Whether you’re a camper looking for a way to recharge your ArkPak or a remote cabin owner needing a power source for extended stays, the ArkPak/Renogy solar panel combo is worth a look.